Gift Cards have become a popular birthday and holiday present, because they are convenient for the buyer, and because they provide flexibility and security to the recipient. Using these cards is very simple, and now, managing these gift cards can be just as easy. MyGiftCardManager is a tool that cardholders can use to check their balance and view their transaction history. This guide details the steps to log in to your Gift Card Manager account at www.mygiftcardmanager.com. Open the Gift Card Manager site at www.mygiftcardmanager.com. Use the blue box on the right side of the screen to enter the Card Number, the 3-digit code found on the back of the card, and the last 4 digits of your phone number. To register the card and create your account, click directly on the “Login” button. Fill in the required information from your card and provide personal details to complete the registration process. The site is totally compatible with Apple and Android technology. Whether you have a laptop, a tablet, or a smartphone, you can log in whenever you need your information. This is especially helpful if you are shopping at a store in person, and need to check your card status. 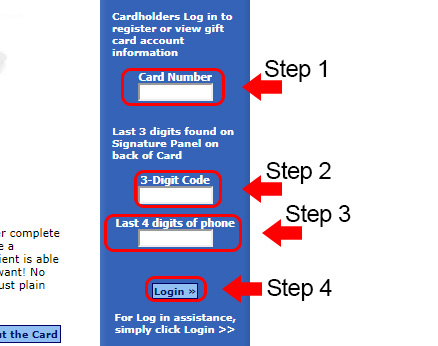 To log in to MyGiftCardManager on a mobile device, follow the steps below. Tap www.mygiftcardmanager.com on your mobile device’s browser. Enter the card number, 3-digit code on the back of your card, and the last 4 digits of your phone number. Tap on the “Login” button. Unfortunately, at the time of writing, there are no My Gift Card Manager mobile apps you can use. However, following the steps in the section above allows you to log into your account, even on the go. The card number is printed on the front of the card, so it should be easy to find. However, if you need help finding the 3-digit code, click the “Login” button on the Login homepage to view the code’s location on the gift card example image. If you have other login issues, you can use the Contact Us link to find the answers you need. If you need more immediate assistance, call customer service at 866-586-4438.